FRESNO, Calif. (KFSN) -- "He was my role model and mentor." That's how 5th District Court of Appeal Associate Justice Charles "Chuck" Poochigian of Fresno describes former California Governor George Deukmejian who died this week at the age of 89. His tough stance on crime and state spending earned him the nickname "The Iron Duke," but Poochigian remembers Deukmejian as a lawmaker and chief executive who took the job seriously, but did not take himself seriously like some politicians. Poochigian called Deukmejian "a man of high integrity and good character" adding he was humble with a well-developed sense of the role of government. Poochigian was in his 20's and recently married when he began working as a Fresno campaign volunteer for then State Senator George Deukmejian who was running for State Attorney General. Poochigian said he was impressed with the soft-spoken, but strong fellow Armenian and later inspired by him to launch his own political career. Chuck Poochigian represented the Fresno area in the State Assembly and the State Senate, but before his legislative career, he was appointed by Gov. Deukmejian to serve on the California Fair Employment and Housing Commission. In 1988, Poochigian joined Deukmejian's senior staff as his Chief Deputy Appointments Secretary, working to identify qualified people to serve on the numerous state boards and commissions under the Deukmejian Administration. Poochigian took on the same responsibilities for Deukmejian's successor, Pete Wilson, before becoming a state lawmaker. He said Deukmejian never cursed or raised his voice to staff and he set a positive tone for relationships throughout the Governor's office. Poochigian told me one of the most flattering things ever said to him by another lawmaker in Sacramento was a positive comparison to George Deukmejian. He said there were times when he was facing a tough issue or decision at the State Capitol that he would ponder to himself "What would George Deukmejian do?" and that would set him on the right course. FILE - In this Nov. 10, 2011 file photo Marvin Baxter is shown at the California Supreme Court in San Francisco. The Deukmejian Administration had several strong connections to Fresno and the Central Valley, and these are just a few of the many. Retired California Supreme Court Associate Justice Marvin Baxter of Fowler was a close friend and also served as Deukmejian's Appointments Secretary. FILE - In this Feb. 15, 2005 file photo Peter Mehas, Fresno County superintendent of schools, speaks at a news conference in Sacramento, Calif.
Former Fresno County Schools Superintendent, the late Dr. Pete Mehas, served as Deukmejian's chief education advisor and the Governor would later appoint Mehas to the State Board of Education. Then, there's political consultant and former Reagan speechwriter Ken Khachigian of Visalia, a close friend of Deukmejian's. FILE - In this June 13, 1996 file photo Ken Khachigian stands in his San Clemente, Calif.
Khachigian served as Deukmejian's senior advisor and strategist during his campaigns for Governor. Khachigian told the Associated Press that the low-key Deukmejian celebrated his come from behind victory over Los Angeles Mayor Tom Bradley in 1982, by enjoying a bowl of his favorite ice cream. The Valley's Armenian community loved Deukmejian. Poochigian says Deukmejian's Armenian heritage caught the attention of local Armenians, but it was the power of his great and compelling personality that endured him to them. Despite their strong political differences, Poochigian says many of California's powerful Democrats at the State Capitol, like Art Agnos and John Burton, respected and appreciated Deukmejian. 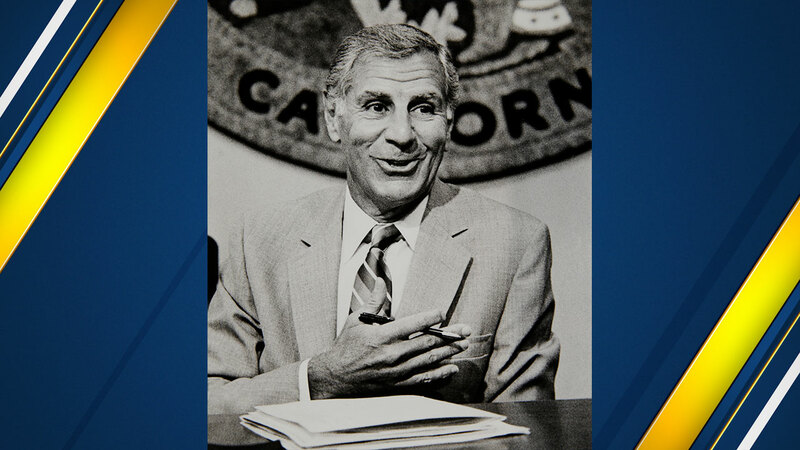 As a young reporter in the mid-'80's, George Deukmejian was the first (but certainly not last) Governor of California I interviewed. We talked one-on-one in a room on the top floor of a Downtown Fresno hotel. I don't remember the topic of that conversation, and my notes from it are long gone, but I do recall what others have said: his polite and gracious demeanor, a direct answer to a question, and his firm grasp of the issue. I dug into the Action News Archives and found a story from October of 1986. The story is about a re-election campaign rally in Fresno for Governor Deukmejian and his attacks on his opponent. Those attacks seem pretty mild compared to today's political rhetoric. By the way, if you look closely, you may see a couple of familiar young reporters covering that rally.